Even though not always required, a majority of blockchain applications entail the use of cryptocurrencies and cryptography-secured tokens. Besides the well-known Bitcoin, over 1000 different ‘altcoins’ (alternatives to Bitcoin) have been introduced over the past few years and many central banks are actively exploring applications involving retail and payment systems.2 Cryptocurrencies are typically regarded as payment-focused and primarily associated with their respective independent blockchains. Meanwhile, blockchain-based crypto-tokens have also gained popularity. In initial coin offerings (ICOs), entrepreneurs sell ‘tokens’ or ‘AppCoins’ created on top of primary blockchains to be dispersed amongst investors around the globe.3 While some tokens are ‘security tokens’ and derive their value from the company's future cash flows, the vast majority of ICOs are ‘utility tokens’, often serving as the media of exchange on platforms.4 Precisely here lies the innovation of blockchain technology – allowing peer-to-peer interactions in decentralised networks. Utility tokens do not derive their value from projects’ underlying cash flows but from their collective usage on blockchain platforms. In order to differentiate between reckless speculation and valuable financial innovation, it is important to first understand the roles that cryptocurrencies or tokens (henceforth collectively referred to as tokens) play in the virtual economy. In particular, it is critically important to understand the interaction between user adoption and token valuation for both academics and practitioners (e.g. Athey et al. 2016). In a recent paper, we develop a tractable dynamic model to shed light on this important interaction (Cong et al. 2018a). Another salient feature of tokens and their associated platforms is the network effect in user adoption. The more users on the platform, the easier it is for a user to find transaction counterpartieson the platformand enjoy the utility from business activities and services. This user-base externality is also prevalent and particularly important in the early stage of adoption for social networks and payment networks such as Facebook, Twitter, YouTube, WeChat, and PayPal. In Cong et al. (2018a), we provide the first dynamic model to capture these features with endogenous token price and user adoption under network externality. Specifically, we consider a continuous-time economy with a continuum of potential users who differ in their needs to conduct transactions on the blockchain.6 Blockchain transactions give agents a flow utility that depends on agent-specific transaction needs, the size of user base, and the productivity of the platform (modelled as a geometric Brownian motion) that loads on exogenous shocks. In the model, agents decide whether to incur the cost of adoption and how many tokens to hold for on-chain activities. The holding of tokens exposes agents to token price changes and introduces an ‘investment motive’ in addition to the ‘transaction motive’. Figure 1 illustrates the economic mechanism. We characterise the dynamic equilibrium without bubbles in order to focus on fundamental valuation. On the quantitative aspect, we use data on token pricing and adoption for 16 major cryptocurrencies from 2010 to 2018 to discipline our choices of parameters in the model. We calibrate the model so that the patterns in the initial phase of adoption match the empirically observed dynamics of token price and user base. This quantitative exercise allows us to develop intuitive understanding of the roles of tokens on user adoption and the determinants of fundamentals-based token valuation. Notes: A positive productivity shock, A, directly increases the current user base, N, by increasing the flow utility on the platform. At the same time, agents expect more users to join the community in the future, which leads to a stronger future demand for tokens and thus token price appreciation. The investment motive then creates a stronger demand for tokens today and greater adoption. The green arrows point to the increases of the current and future (expected) levels of productivity A, where µA is the drift of the productivity process, which lead to higher flow utilities of tokens, and in turn, larger user bases N(black arrows). The blue arrows show that increases in user base result in even higher flow utility due to the contemporaneous user-base externality. Finally, more users push up the token prices Pin future dates, which feed into a current expectation of token price appreciation and greater adoption (red arrows). One key contribution of our study is to clarify the roles of tokens on platform adoption. To this end, we compare the endogenous S-curve of platform adoption with and without tokens.7 Without tokens, user adoption is often below the socially optimal level for a promising platform with improving productivity. Tokens can increase welfare because agents foresee token price appreciation and adopt more. Embedding tokens on a promising platform therefore front-loads prospective growth, as illustrated in Figure 2. A caveat is that tokens may also lead to over-adoption in the very early stage. Similarly, for a bad platform whose productivity is expected to deteriorate, tokens can precipitate its demise, which again can be welfare-improving. Notes: This figure plots four cases of user base dynamics against a measurement of the quality of blockchain platform, ln(At). The solid blue curve is the user base from our model of endogenous adoption and token valuation, which matches well with the grey dots, the real data of user base (proxied by active addresses) of major cryptocurrencies. In our paper, we describe the data in details. The green vertical line marks the level of platform quality, above which the first-best adoption level should be 100%, and below which, it should be zero. As we can see from the graph, the tokenised economy (blue solid) curve brings user adoption close to the first-best level relative to a same platform without native cryptocurrency (the red dashed curve). Also, below the first-best threshold, (over-) adoption induced by tokens is small in magnitude. Overall, our model produces key patterns in data regarding user adoption and shows how tokens accelerate adoption. Second, we show that introducing tokens can reduce user base volatility, making it less sensitive to platform productivity shocks. The key driver is again the agents' investment motive – their decisions to participate depend on their expectations of future token price appreciation. Consider a negative shock that reduces the flow utility, which in turn lowers user adoption. This direct negative effect is mitigated by an indirect effect through token price – a lower adoption now means more agents can be brought onto the platform in the future. Agents' expected stronger token price appreciation therefore induces them to adopt and hold tokens. Similarly, a positive productivity shock increases adoption by increasing the flow utility. However, as the pool of potential new users shrinks, the expected token price appreciation declines, discouraging agents from joining the platform and holding tokens. 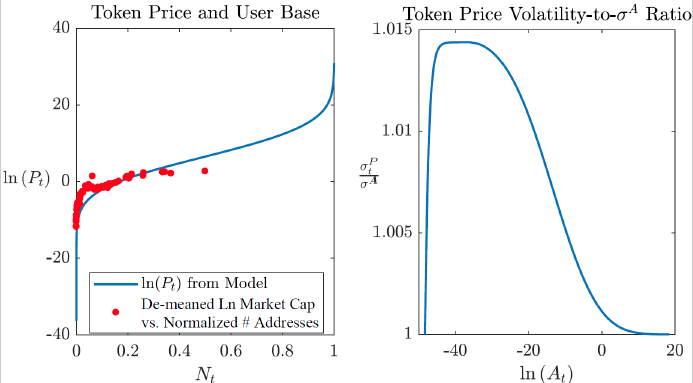 In summary, the equilibrium determination of token price appreciation dampens the effect of productivity shocks on user-base dynamics. Given the roles of the tokens in accelerating and stabilising user adoption, entrepreneurs may want to introduce them in a platform. One way is to issue tokens to early investors through ICOs which brings in capital for developing the platform as well. Then through retaining some tokens, the early investors and entrepreneurs can also enjoy the token price appreciation. In Cong et al. (2018b), we develop a model that explores the ICO mechanism and optimal decision-making by entrepreneurs and platforms designers. 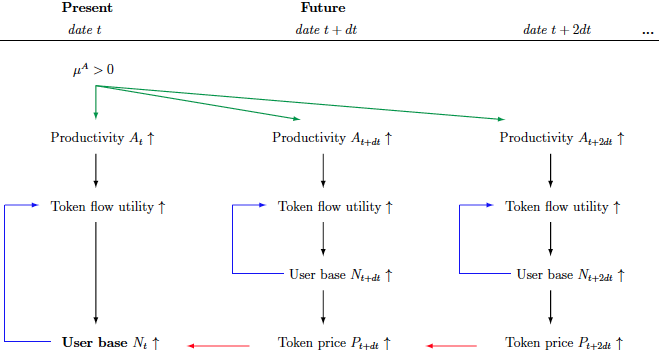 The dynamic feedback mechanism in Figure 1 also leads to a token pricing formula that incorporates the user base, agents' expectation of future popularity of the platform, the platform productivity, and user heterogeneity. Figure 3 plots the token price against the user base (with 1 denoting full adoption) in the left panel. On the right is the ratio of token price volatility to exogenous volatility of platform quality. As the platform quality improves, a volatility run-up occurs due to the endogenous growth of the user base. Notes: The left panel plots the logarithm of token price against the normalised user base (with 1 being 100% adoption). The blue solid curve is produced by our model while the red dots correspond to the real data of major cryptocurrencies. In our paper, we describe the data in details. Our model successfully produces the key pattern of early stage adoption—price runs up quickly as user base increases, and on a logarithm scale, it stabilises. Moreover, our model delivers an out-of-sample prediction, which is the eventual run up of token price as user adoption approaches 100%. The right panel plots the ratio of token price volatility and the volatility of platform quality from our model, a measure of excess volatility due to endogenous user adoption. It shows a run of volatility in the early stage of platform development (i.e., relatively low values of ln(At), the measure of platform quality in our paper). While the pattern is qualitatively interesting, the magnitude of excess volatility is not large, and at its peak, amounts to 1.5%. 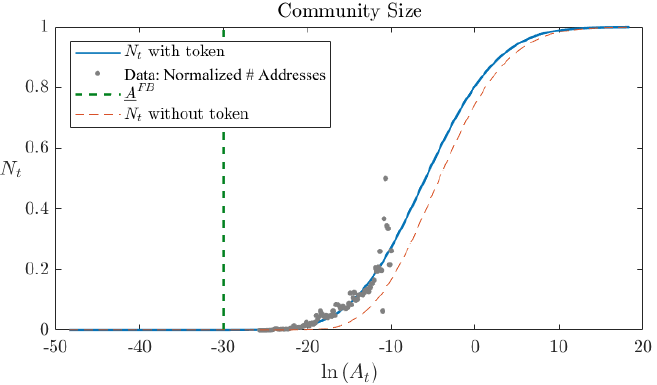 This finding suggests that to obtain more drastic dynamics in token price volatility, we may consider other sources beyond endogenous user adoption, which we discuss in Cong et al. (2018a). Our model is flexible enough to accommodate multiple additional features observed in practice. For example, the platform productivity can be endogenised by incorporating consensus provision – cryptocurrency competition can be modelled by specifying reflecting boundary conditions; one can introduce the design of state-contingent token supply for incentive provision in a sharing economy that is decentralised with on-demand labour; one can also study behavioural elements to accommodate the possibility of bubbles, so as to better match empirical observations; finally, crypto-investors can use the cross-section predictions to construct portfolios of cryptocurrencies. More broadly, our framework can be applied to dynamic pricing of assets associated with a platform or system with network externalities. Athey, S, I Parashkevov, V Sarukkai and J Xia (2016), “Bitcoin pricing, adoption, and usage: Theory and evidence,” Working Paper. Cao, S, L W Cong and B Yang (2018), “Auditing and blockchains: Pricing, misstatements, and regulation,” Working Paper, Invited for Submission atJournal of Accounting Research. Catalini, C and J S Gans (2018), “Initial coin offerings and the value of crypto tokens,” NBER, Working paper 24418. Cong, L W and Z He (2018), “Blockchain disruption and smart contracts,” Review of Financial Studies, forthcoming. Cong, L W, Y Li and N Wang (2018a), “Tokenomics: Dynamic adoption and valuation,” Working Paper. Cong, L W, Y Li and N Wang (2018b), “Tokenomics: Dynamic incentives and decentralized contribution,” Work in Progress. Howell, S T, M Niessner and D Yermack (2018), “Initial coin offerings: Financing growth with cryptocurrency token sales,” NBER Working paper 24774. Li, J and W Mann (2018), “Initial coin offering and platform building,” Working Paper. Makarov, I and A Schoar (2018), “Trading and arbitrage in cryptocurrency markets,” Working paper. Sockin, M and W Xiong (2018), “A model of cryptocurrencies,” Working paper. Although Bank of England Governor Mark Carney dismissed Bitcoin as an alternative currency, he recognised that blockchain technology benefits data management by improving resilience by “eliminating central points of failure” and enhancing transparency and auditability while expanding what he called the use of “straight-through processes” including with smart contracts. In particular, “Crypto-assets help point the way to the future of money”. See, e.g., here. For various applications of the technology, we refer the readers to Harvey (2016), Cong and He (2018), and Cao et al. (2018). Many altcoins such as Litecoin and Dogecoin are variants (forks) from Bitcoin, with modifications to the original open-sourced protocol to enable new features. Others such as Ethereum and Ripple created their own blockchain and protocol to support the native currency. According to CoinSchedule, in 2017 there were 235 Initial Coin Offerings. The year-end totals came in at over $US3 billion. An emerging literature has studied cryptocurrencies and tokens in the context of ICOs (e.g., Sochin and Xiong 2018, Catalini and Gans 2018, Li and Mann 2018, Howell et al. 2018) or as an asset class (Makarov and Schoar 2018). Regulators are also actively investigating the new technology to understand its impact on traditional industries such as trade finance and auditing (e.g. Cong and He 2018, Cao et al. 2018), in order to formulate the appropriate policy. As is the case for many high-profile issuances such as Golem, 0x, Civic, Raiden, and Basic Attention Token (BAT). Proof-of-Stake protocols typically involve such work tokens or staking tokens. Notable implementations include Keep (off-chain private computation), Filecoin (distributed file storage), Truebit (off-chain computation), Livepeer (distributed video encoding), and Gems (decentralised mechanical Turk). To enforce some sort of mechanism to penalise workers who fail to perform their job to some pre-specified standard, work tokens have to be held. We broadly interpret transaction as including not only typical money transfer (e.g., on the Bitcoin blockchain) but also signing smart contracts (e.g., on the Ethereum blockchain). Similarly, blockchain productivity should also be broadly interpreted as the general usefulness of the platform, technological changes, or regulatory shocks such as the ban on cryptocurrency trading by several governments. An S-shaped curve is often produced by the Bass diffusion model, a workhorse model in the marketing literature. Our model differs in the endogenous adoption dynamics rather than exogenously hard-wired dynamics of user distribution.